will add 5 files to the Common folder. 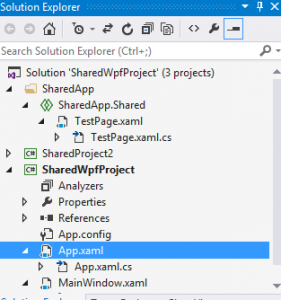 – Add some content for your Xaml – e.g. This document was very useful. I was looking specifically at the Babel project in the above sample; this won’t compile under MvvmCross 4.2.2. I’ve listed here everything I needed to do to make it. This entry was posted in C#, MVVM, MVVM Cross and tagged 4.2.2, MVVM, MVVMCross, Upgrade, UWP, Windows 10, Windows 8, Windows Store on August 6, 2016 by pcmichaels. I recently came across a need to serialise and de-serialise an ObservableCollection from an MVVMCross application. To achieve this, I created a couple of helper methods which I’d like to share. Both use the MVVM Cross File plug-in. Obviously, the `DeSerialise` cannot, as it would change the object that you are extending. This entry was posted in C#, MVVM Cross and tagged Deserialise, Deserialize, File. 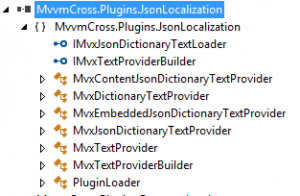 Serialise, MVVM, MVVM Cross, MVVMCross, Plug-ins, Serialize on May 6, 2015 by pcmichaels. This article describes how to stub out the IMvxMainThreadDispatcher, used by MVVM Cross, using Rhino Mocks. Here is an excellent article on unit testing in MVVM Cross. As with many of my posts, this is predominantly for my own use; and, as with those other posts, I hope you’ll find this useful. This entry was posted in C#, MVVM, MVVM Cross and tagged c#, IMvxMainThreadDispatcher, MVVM, MVVM Cross, MVVMCross, RhinoMocks, Stub, Unit Test, Unit Testing on March 14, 2015 by pcmichaels. This is quite a straightforward process, and well documented in several places – including here and here; and the sample that I used to create mine (and this tutorial) is here. However, I couldn’t find a step-by-step tutorial in a single place. So this is pretty much for my future self. This only applies to Windows Store and Windows Phone. Although I believe the same process applies to iOS and Android. The plug-in that I’m creating here will create a secondary tile on Windows Phone / Windows Store. However, this only covers the phone part, and doesn’t actually cover tile creation. The project that I’m dealing with is a re-write of this application, using C# and MVVM Cross. Obviously, your structure may be different, but the important thing is the Plugins folder at this stage; create a new portable project. Obviously, the next stage depends on your specific implementation. Mine depends entirely on the platform, so that’s all I need to do in the portable library. So, to all intents and purposes, the plug-in is now written (admittedly it only exists for Windows Phone, but that’s beside the point). Next, it needs to be used; the first thing is to reference it. `MvxPluginBootstrapAction` signifies that the call to `MvxSetup` will call the BootstrapRunner for this plugin. Or, to put it another way, this magically makes MVVMCross aware of your new plugin for each platform. Above, I’ve basically manually added the reference to the correct project. This works fine when I’m working locally, but for an actual distributed plug-in, it’s NuGet that handles this. 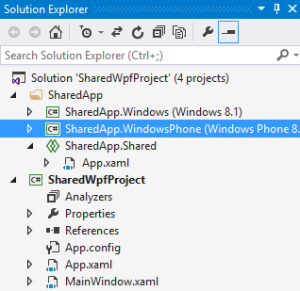 This entry was posted in C#, MVVM, MVVM Cross, Windows Phone, Windows Store Apps and tagged Bootstrap, Cross Platform Development, IMvxPluginLoader, IMvxPluginManager, MVVMCross, MVVMCross Plug-ins, MvxPluginBootstrapAction, Plug-ins on January 25, 2015 by pcmichaels. Following on from this post I discovered that I did, indeed, have a recursive reference in my game file. After a little searching, I found this excellent article on how to prevent this error, and to make the Json serializer behave rationally. (it does go into more detail and I encourage everyone to read it). Job done. It now works! This entry was posted in C#, Game Development, MVVM Cross and tagged c#, JSON, JSON.NET, MVVM, MVVM Cross, Newtonsoft, Plugin, Stack Overflow on December 25, 2014 by pcmichaels. The problem was that I had a starting population of 10,000 people. There are other ways to solve this: representing the reference between the classes as some kind of index, debugging the creation code, etc… However, I wanted to see if I could write a program to detect this. Quickly running this will error with a stack overflow (to clarify, slowly running it will result in the same error!). This is, admittedly, not a simple or short piece of code; having said that, it doesn’t do anything complex, once you’re happy with the reflection, the rest is just a recursive tree. To use this, simply call `DetectRecursion` in the above test program before calling serialize (or instead of). This entry was posted in C#, Compiler Errors, Console Applications, MVVM Cross and tagged JSON.NET, MVVM Cross, Recursion, Recursive, Serialization, Serialize, Stack Overflow on December 5, 2014 by pcmichaels. Recently I upgraded from MVVMCross 3.1.1 to 3.2.1 and everything broke. The reason was that suddenly, the MvxStorePage was unavailable. I’m sure many people knew this; but I wasn’t one of them. This entry was posted in C#, MVVM Cross and tagged c#, MVVM Cross, MvxStorePage, MvxWindowsPage, Namespace, Windows Store Apps, WinRT on November 15, 2014 by pcmichaels. The new thing for VS 2013 is Universal Apps. They allow you to create a Win 8 and Phone app with shared code. 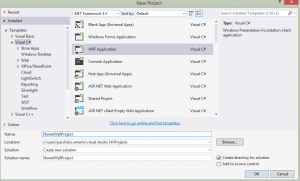 But what if you’re writing LOB apps in WPF, maybe using MVVM? You may have a Winforms app and a XAML app, and want to share code; or have two WPF apps that share a core code base, and some screens. This post walks through creating a sample shared app. 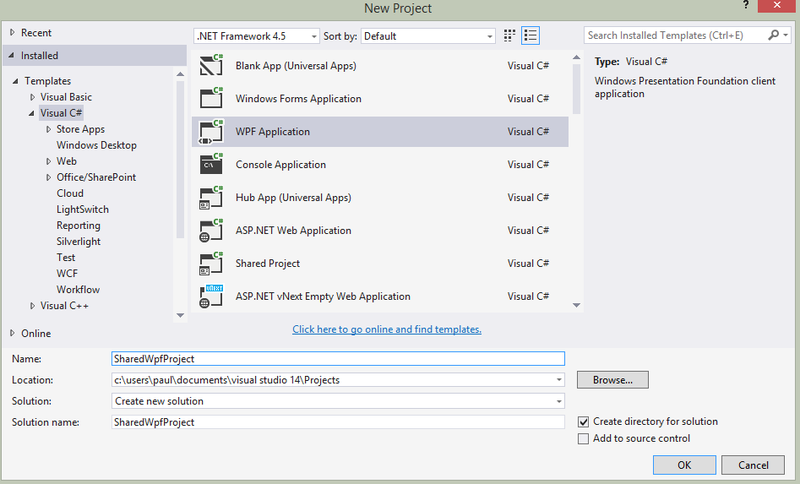 Okay, so we have a WPF application (as you might already have). How to create a shared project? Well, the bad news is: you can’t; at least as far as I’m aware (please, please, please let me know in the comments if you know this to be false!). Now, what comes next might feel like a hack… and there’s a good reason for that! The important thing here is the `Label`. However, you’re most likely to get the path wrong. If you do then when you update the project in VS it will fail to load and give you an error message telling you where it’s trying to find the shared project. Having done this a couple of times, my advice is have this error message up, and try to navigate to the path in Windows Explorer: you should see where you went wrong quickly enough. You will get the assembly of the running application. Effectively, you’ve created a kind of link between the projects, without the messiness of actually creating a link. The consequences of this are that you must ensure that code in the shared project only has dependencies that can be resolved in ALL the projects that include the shared project. I’ve tried this on MVVM Cross using two projects and sharing XAML files; and it works. MVVM Cross looks in the current assembly for a `MyView`, when you navigate to a `MyViewModel`. It will find it providing all your projects reference the shared project and you do not try to re-implement the view. 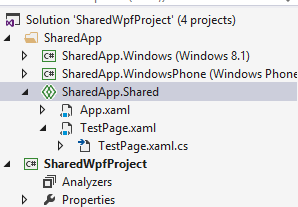 – Creating a shared project between Winforms and WPF that shares a XAML file will most probably not work (admittedly I haven’t tried it). – Creating a shared project for two WPF projects and copying MyView.xaml into the shared project, leaving the original intact will cause MVVM Cross to fail to resolve the page (because it doesn’t know which one you want). 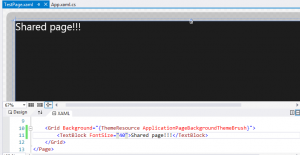 This entry was posted in MVVM, MVVM Cross, WPF, XAML on November 7, 2014 by pcmichaels. While creating my game, I recently came across the problem of navigation. This post describes how to create a custom user control and react to the event inside. The usual disclaimer still applies here; although this is an MVVM Cross post, the contents of it should be applicable for any MVVM Framework or, in fact, any XAML binding at all. The user control that I’m going to use is simply a navigation bar to appear at the top of each screen. So, you’ve now exposed two dependency properties and bound them to the XAML in the user control. And that just binds to the ViewModel as you would expect. For me, this is in a base view model, so it responds to the same command in every view. I think the final version of this code will interact with an IMvxPresenter in some way, which may make another post. This entry was posted in C#, MVVM, MVVM Cross, Windows Store Apps, WPF, XAML and tagged Binding, c#, MVVM, MVVM Cross, windows runtime, WinRT, wpf, XAML on October 12, 2014 by pcmichaels. 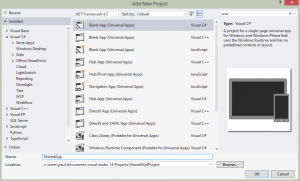 How to bind Windows 8 XAML to a View Model. Although this post is based on an example using MVVM Cross, it will work for any MVVM framework, or even a customised one. I have a collection of data that I want to display in a customised format. My architecture is MVVM (using MVVM Cross). The principle here is that my data is stored in a model, but shaped in the ViewModel into a digestible format for the view. In my specific example, I have a list of people, and based on a specific criteria, I want to display a selection of these people in the view. For the sake of this article, I want to display people with a name starting with “D”. This entry was posted in C#, MVVM, MVVM Cross and tagged c#, DataBinding, WinRT, XAML on August 24, 2014 by pcmichaels.